Growing up in the Pacific Northwest, Morris Graves (1910-2001) always stepped to the tune of a different drummer. As a sickly child with a love for flowers, he spent hours designing rock gardens in his mind and later, as a young proto- hippie, he dropped out of high school to embark for the Orient by ship. ''In Japan I at once had the feeling that this was the right way to do everything,'' he later said, and his feeling for Asian religion and philosophy has always imbued his work. Closely allied with the visionary, Asian-influenced group of Northwest artists led by the late Mark Tobey, Graves has produced a mystical art in which spiritual states are expressed by elemental symbols - birds, flowers, pine trees, the sea - as well as by Buddhist motifs. 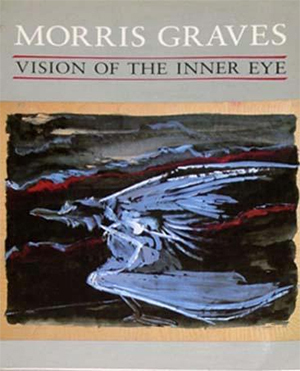 We get a bird's-eye view of his very productive career in ''Morris Graves: Vision of the Inner Eye," a collection of more than 100 paintings - mostly in the tricky medium of tempera on paper - sculptures and drawings from the mid-1930's to the present (as of the date of this publication).